Long Shot Summer by Neil Robinson – Book Review . With the England team continuing to suffer in the Caribbean against a resurgent West Indies side, it’s the perfect time to be taken back just over 30 years to the even greater travails of the English national cricket team. 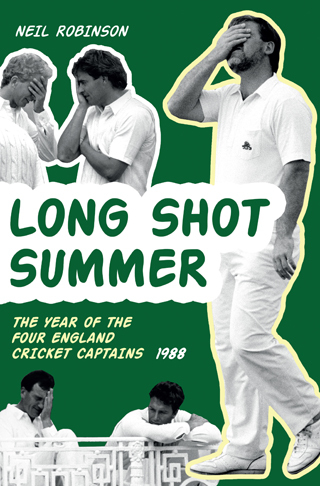 If supporters and followers think they’ve got it bad now, then they can think again in comparison to the infamous summer of 1988, when England managed the quite remarkable, and generally self-inflicted, feat of using four captains in just five Tests. That fact remains the headline news from all those years ago, along with the supposedly salubrious details surrounding the sacking of Mike Gatting (more on that later), but Neil Robinson has delved a little deeper and also managed to clarify much of what happened at the time in this easily digestable book. Featuring interviews with many of the chief protagonists, Robinson evokes a time when tabloid journalism ran amok and focused much of its ire on England’s football and cricket teams (even more so than it does now), and gets across several viewpoints that had become forgotten in the mists of time. Having grown up during the 1980s and admired the qualities of the legendary West Indies side, this book also appealed to me as a fan of an era of Caribbean cricket that seems destined never to be repeated, despite how well the current crop are playing against Joe Root’s men. While the Windies weren’t at their prime by 1988, they were a force to be reckoned with, with the likes of Viv Richards, Gordon Greenidge and Malcolm Marshall still in fine fettle, but any side that could boast the likes of David Gower, Allan Lamb, Graham Gooch, Ian Botham and Mike Gatting had to be in with a chance, didn’t they? Well, as it happened, no. No they didn’t. As an example of shooting themselves in the foot, the decisions taken by the England selection panel have to be right up there. Robinson documents the random nature of the decision-making, a complete ineptitude of leadership and man-management, and an inability to simply pick a team and stick to it. Granted some external matters couldn’t possibly have been predicted and the odd injury was unfortunate and untimely to say the least, but the likes of Peter May and Ossie Wheatley have to count themselves in large part responsible for that extraordinary summer. In this day and age the move from pitch to either commentary box or some sort of management position seems to take all of five minutes, while back in 1988 there was still a large element of what Will Carling famously called the ‘old fart brigade’ in reference to his particular sport and the make-up of the RFU. That distance between management and players was never to be as large again. Robinson isn’t afraid to apportion blame, in particular, and quite rightly, in putting the boot in on the tabloids for the impact they had on the life of Louise Shipman, the barmaid caught up in one of the ‘scandals’ of the summer, and he’s also willing to give the players a fair crack, even when some of them didn’t exactly help themselves on or off the field. In doing so, he’s produced a thoroughly entertaining read that, if nothing else, makes you realise that even today’s under-fire England XI have an awful long way to go before they can be pigeonholed alongside the 1988 vintage.